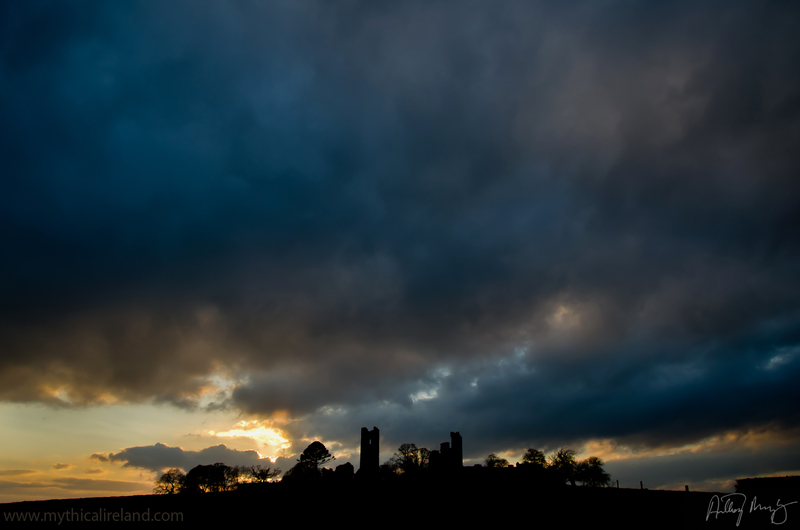 Took a quick trip up to the Hill of Slane this evening on the way home from the playground with the kids. The clouds were breaking and the sun was trying to come through and it looked like something dramatic would happen in the sky. I caught this lovely scene with billowing dark cumulus clouds hanging over the ruins on the hill about a half an hour before sunset. 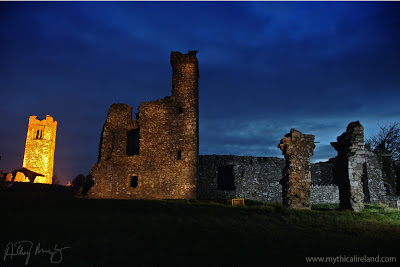 The ruins on the Hill of Slane, illuminated by different types of lighting, in the evening glow after sunset. 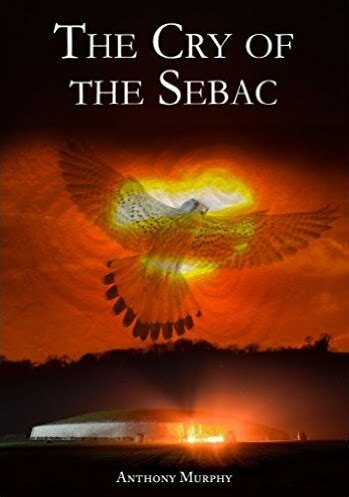 This is the place where, according to tradition, Saint Patrick lit the Paschal Fire in contravention of the laws of Ireland, and in direct view of the King, Laoghaire, who saw the fire from nearby Tara. In earlier tradition, the Fir Bolg king Sláine was said to have been buried in a mound behind these ruins. 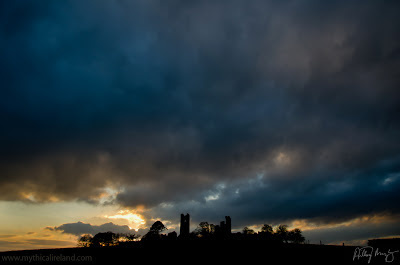 It is from this king that the modern village of Slane gets its name. 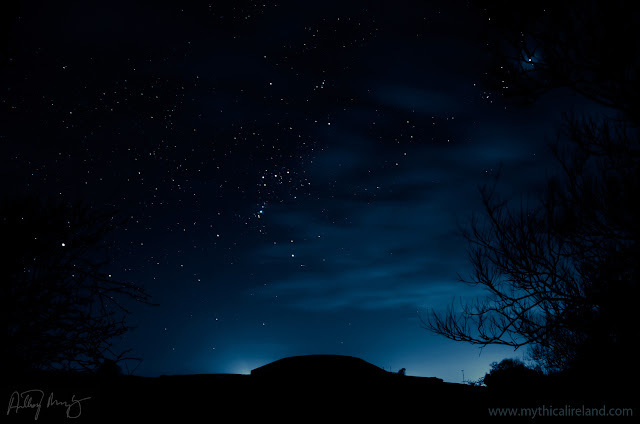 This is a photo taken tonight showing the constellation Orion, flanked by Taurus the bull to the upper right and Sirius the dog star to lower left, sitting above Newgrange. I went for another filtered artistic look (created in Photoshop). I like this look because the original photo is very red and orange due to light pollution. It was just starting to cloud over when this photo was taken. 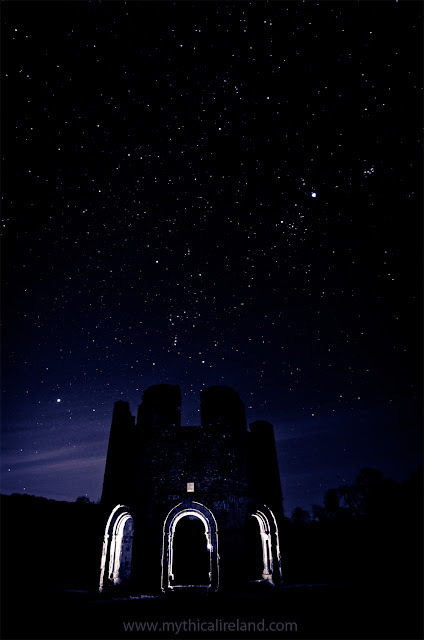 I think the cloud helps to enhance the photo, although it does demonstrate just how much the Boyne Valley suffers from light pollution these days. In ancient times Orion was venerated as a god and warrior constellation in many guises. He is seen to control the movements of the sun, moon and planets, which pass through his upraised hand. Also in this image, just above right of the V-shaped head of Taurus, is the bright planet Jupiter, somewhat obscured by cloud. This is an artistic rendering of a photo taken last night at Mellifont Abbey, County Louth, with the assistance of my daughter Amy. This structure is called the lavabo. It was one part of an extensive abbey built by the Cistercian order at Mellifont. It was the Cistercians who came into the ownership of Brug na Bóinne and who gave Newgrange its modern name. In the photo you can see Orion above the lavabo with Sirius to his lower left, Taurus and the Pleiades to the upper right and, just above and right of the bull's head is the bright planet Jupiter.